ACOUSTIC EXPO 2013: "We are now in a full blown renaissance. Never has the British (and beyond) folk scene been so vibrant in my memory as it is now. When my curiosity first ventured into the beginnings of a lifelong love affair with the traditional / folk canon and I actually began singing and playing it you could cut any conversation amongst peers dead in its tracks by the mere mention of the 'F' word. "'I sing folk songs'… awkward silence would descend, a tumble weed would waft past taking all semblance of the known world with it like a bad smell leaving. Then people would leave. Seriously though, things have changed in England. Big time. Nowadays, folk wise, we seem to exist in an entirely parallel world, a realm where mainstream media and every other TV add is using a 'folk' instrument and 'folky' singer to sell it's wares. I sometimes have to blink. 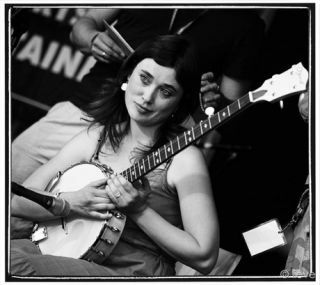 "One of the biggest and most successful bands of the now (Mumford and Sons) uses a banjo for Chrissakes! Singer songwriters with guitars, ukuleles, banjos, harps and so on are more common than hens beaks. I think this is a good thing. "I know there are those who would grumble that there is still not enough room or respect within mainstream music for the wonderful canon of ballads and songs we call traditional folk music, and I would agree. There are also those who at this point have a gripe which points to some aspects of the current trend falling into cliché and formula, couldn't totally disagree with that either. "However, what seems really unique to me at the moment is really how many people - young, middling, mature - within the folk scene and without, are looking to all things folk (song/lore/history/art/music) for inspiration and for the last half a decade at least. A marked observation particularly is the amount of young people singing and playing folk song now compared to the uptake say 15 years ago. "The last five-ten years has seen many new young acts emerge and become draws at folk festivals both at home and abroad. Most interestingly, how varied has the folk scene become again?! Full of colour, full of ideas and vibrancy, the broad church of folk music has widened no end to include a seemingly infinite number of new and old style experimentation replete with tags to describe them; twee folk, renaissance folk, psyche folk (that's actually an oldie, so is acid folk), and of course the much banded about 'nu' folk, have we had techno folk yet? Bet we have. "It's all good, that's what I think and long may it continue." Lisa Knapp's new album, Hidden Seam, is out now on Navigator. For more information visit her official website.